We've all heard the story many times now: talented game developers leave their corporate jobs to strike out on their own, turning to Kickstarter in the process. So what makes The Flame in the Flood stand out? Something about BioShock's art director making a modern fancified version of The Oregon Trail, if you ask me. Scout must survive at all costs, and much of the gameplay involves fulfilling her basic needs: staying fed, dry, and alive. Water is a key theme of the game; in this harsh landscape, getting wet means getting sick, something Scout can ill afford. Crashing your raft or just being caught in the rain can be as deadly as any predator. Drinking contaminated water can result in dysentery. Ok, hazardous environments. Fear of drowning and disease. The Kickstarter page also mentions "snake bites, fatigue, hypothermia, open wounds, and infection" as other possible causes of death...which is permanent, mind you. I like the sound of this. Speaking of predators, Scout must deal with those as well. Wolves and worse populate the wooded islands. Scout has no superpowers, so she must rely on stealth and her wits to survive. For instance, a pack of wolves could be distracted by fighting over a rabbit you caught in a makeshift trap, or killed by meat you poisoned with hemlock or another deadly plant. Crafting plays a large role in Scout's survival. The Molasses Flood's workspace is filled with outdoor survival manuals and wildlife guides, part of its effort to base all the tactics in the real world. If you catch the flu, you might be able to cure yourself with penicillin made from moldy bread. You can eat the roots of cattails and use the tops to pack in your coat as insulation. Dowling gives an example of how the team crafts gameplay out of the natural world: "If you burn sumac in the real world it creates a poison gas," he says. "Maybe there's a tool in the game where you have an empty jar, burn the sumac, and capture the poison gas in the jar and make a 'gas grenade.' That's about as far as it will extend into video game territory. It's that half step past reality." Obviously, every game's crafting and survival mechanics will require incessant tweaking and mindful balancing to succeed. But I love the spontaneity and inventiveness that they're describing here. I mean: healing yourself with moldy bread? Can you get much more gritty and masochistically roguelike than that? My only hope here is that by being a small indie studio with "total creative freedom" (as Game Informer emphasizes at several points when discussing the shift from working in AAA games to leaning heavily on crowdfunding) means that The Flame in the Flood can really embrace its wackier, more ambitious ideas rather than just ending up as a pretty-looking alternative to, say, Metal Gear Solid 3: Snake Eater. Or the next Fallout, only with a rafting mechanic. Which is also a game I would totally love to play at some point, now that I think about it. 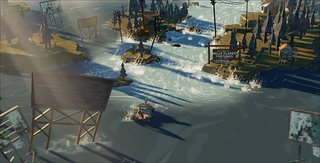 Read more about The Flame in the Flood at the game's Kickstarter page.